Isuzu has built itself a pretty solid reputation mostly thanks to its rugged trucks, but the company builds also pickups. 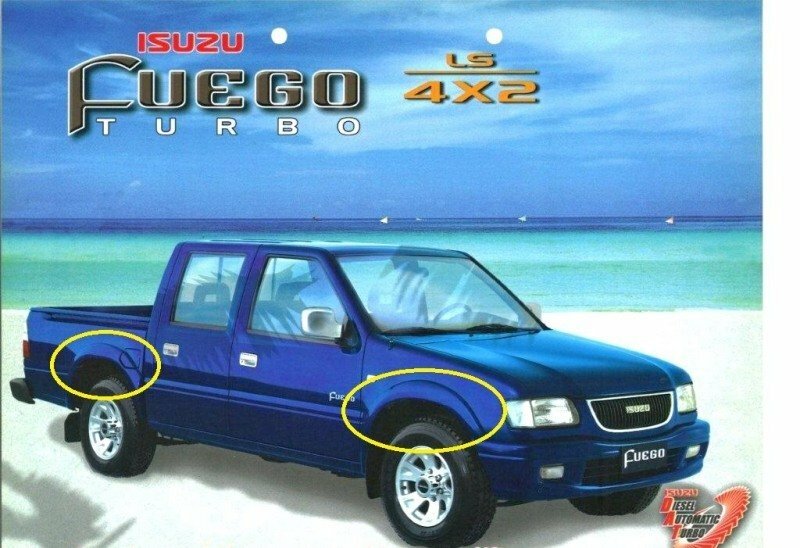 The Isuzu Fuego pickup truck was commercialized between 1998 - 2005 and was the typical utilitarian work horse that was usually found in the middle of nowhere carrying some serious loads at the back. The Fuego was a success story for Isuzu until it was replaced by the newer D-Max which came up with a sharper style, stronger engines and a more refined cabin. The Fuego was available in both 4x2 and 4x4 drive configurations and power came from either a 2,499cc or a 2,771cc engine. When it comes to exterior styling, the Fuego was at par with what you’d usually get in this segment, featuring a robust design and a rugged look. The overall body panels were pretty clean without any dynamic creases to break up the monotony. The most interesting part of the truck was of course the front fascia that received a curved “U” shaped grille with vertical stripes. The bumper was pretty rudimentary and came with a rectangular air intake and two robust fog lamps. The flared wheel arches housed a set of huge off road wheels that were combined with a high ground clearance, betraying the all terrain capabilities of the vehicle. Around the back there was a pretty big load bed and a set of rectangular taillights. To offer easy access into the tray, the rear bumper can be also used as a convenient step. The cabin has a no nonsense design and has a pretty solid build quality. We’re happy to notice that the center console is laid out in an intuitive way and every control is placed within easy reach. There are also plenty of cubby holes where you can keep you things safely and we especially like the big box sculpted into the dash in front of the passenger seat. As it was expected, the material used for the dash and doors is hard, cheap-feeling textured plastic that sounds hollow when tapped with a finger. To help the seats survive the grueling indignities of commercial duty, Isuzu wrapped them in resistant upholstery and for superior trim levels there was also available leather as standard feature. Talking about the seats, they are fairly big and comfortable, with plenty adjustments and offer proper support for both long and shot journeys. 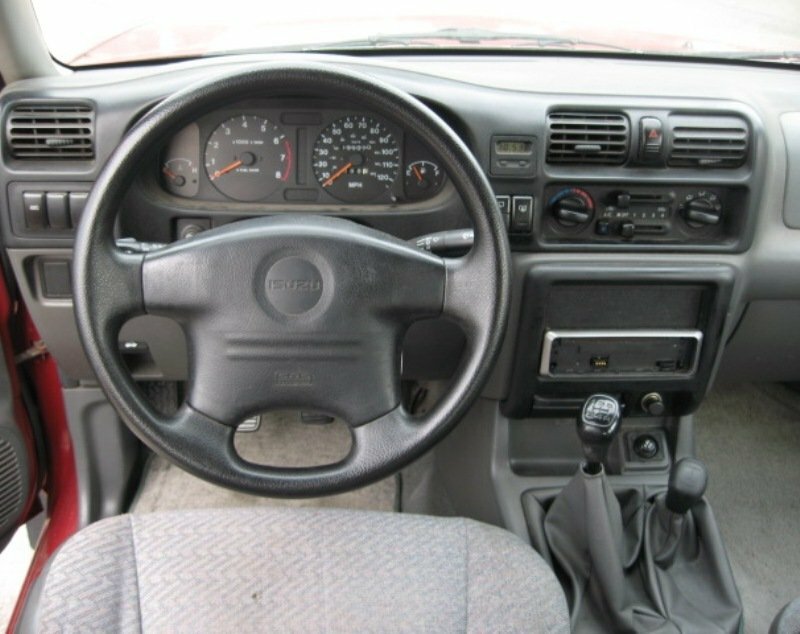 The steering wheel is also adjustable and offers a decent grab despite its rudimentary design. The driver is met by a clean and clear instrument cluster which can be easy red during both night and day. Thanks to the high ground clearance, the raised seats and the big windscreen, you have a fairly wide angle of visibility which gives you a top notch road visibility. The cabin is also fitted with a sliding rear glass which will come in handy if you want to reach for some things placed in the load bed. Two engines are on offer namely the 2,499 cc and 2771 cc units. The first engine develops 78 hp at 4000 rpm and 170 Nm of torque at 2300 rpm, while the latter comes with 100 hp on tap achieved at 3800 rpm and a peak torque of 230 Nm at 2300 rpm. The engines use timing chains which makes them noisy and unrefined but also more reliable. They provide a decent punch, but they’ll find it hard to reach three digit speeds as they aren’t exactly speed demons. On the other hand, their generous low end torque deals great with heavy loads and the climbing abilities are also decent. There are offered both manual and automatic transmissions, but the latter one is best left to be used with the standard setting during normal driving as it offers a good mix between performances and fuel consumption. If you’ll want more punch you can shift into the power drive mode where the engine speed drop is almost absent and gear ratios are a bit longer to take advantage of the maximum power available. Up front, the Isuzu Fuego gets and independent, double wishbone setup combined with rear semielliptical leaf springs. Ride quality is surprisingly comfortable and you are well protected against various potholes or road bumps. With some weight at the back the ride quality will improve even more. 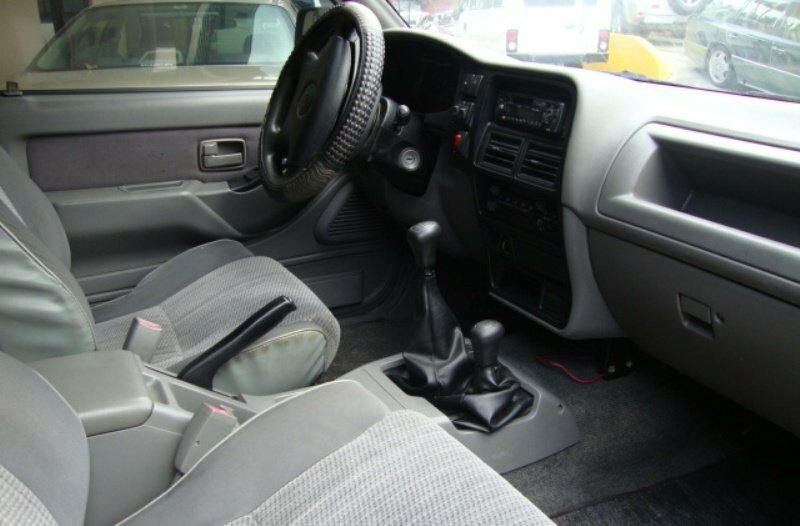 The power-assisted steering is a bit heavy, but it copes well with the rugged nature of the truck. The Fuego has also a pretty composed handling and the body roll is well controlled. Moreover, the wide- tires really help in maintaining excellent contact with the road. If you get too frisky with the go pedal, the brakes will do a decent job of bringing things under control. 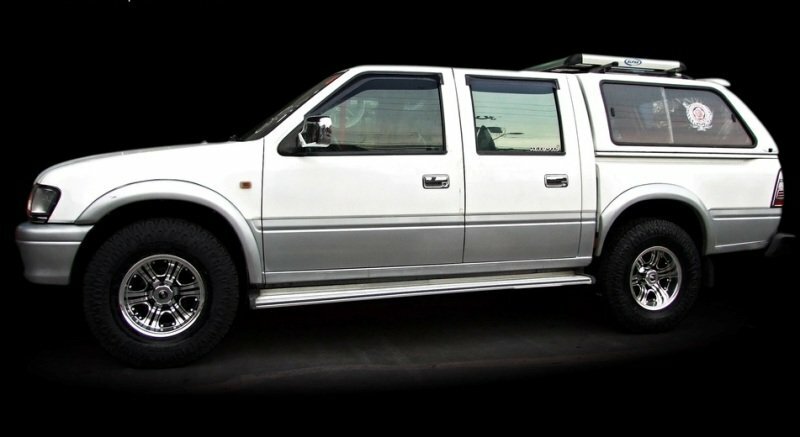 Isuzu equipped the Fuego with standard front disc brakes and rear drums. The old Isuzu Fuego was a basic work horse that offered a strong build quality and reliability, combined with decent engines and capable ride and handling abilities. The truck managed to deal well with off road driving too and it was also fairly efficient for its time. On the other hand, the cabin wasn’t as comfortable as other trucks in the segment and the exterior design won’t win you any beauty awards. However, these departments aren’t on top of the list when we are talking about pickups anyway.